Home // Palmerbet // Super Rugby Special get a Free Bet Bonus if your team leads at half time but lose. 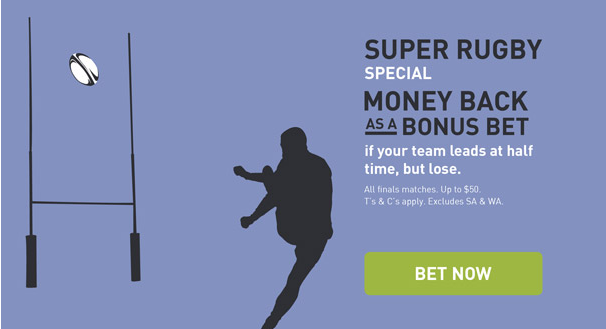 View Palmerbet’s Super Rugby Finals special in which you get a bonus bet up to your bet amount if the team you back lead at half time but lose. Boosted odds on First Try Scorer markets for all players in State of Origin game 2. This promotion is available on game day (22/06/16). Palmerbet reserves the right to alter the times of the promotion at any time. Maximum stake of $50AUD. Any amount exceeding $50 AUD will be cancelled. NOTE: Boosted odds only available on game day.